Johnny Chan was born in Guangzhou, China in 1957. He was raised mostly in China before his family immigrated to the US looking for a better life – the American dream. His family ran and owned several restaurants in Houston, Texas, and Chan was supposed to follow suit and take over the family business. This is why he entered the University of Phoenix and was majoring in Hotel and Restaurant Management before he decided to become a professional poker player. It was not until he was sixteen, when he went to Las Vegas looking for some fun, that he got hooked on poker. Once he turned twenty-one he finally moved to Las Vegas and became a professional gambler and poker player. He became notorious at winning in the early stages of his poker career since many other players had not had an Asian opponent before. This was a big advantage for him during those early years in his career. He managed to make his first WSOP win in 1985, by winning the Limit Hold’em event and earning $171,000. His fame and fortune skyrocketed when he won two-consecutive years in the World Series of Poker. He won the 1987 and 1988 No Limit Hold'em World Championship, making $1,325,000 combined. He nearly got a third straight win in the 1989 WSOP main event, but he ended up getting second place after Phil Hellmuth. He has been the last player to win two consecutive years while playing in the WSOP, for now at least. 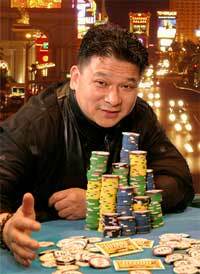 Johnny Chan later went on to win another seven times at the WSOP. He won the 1994 WSOP Seven Card Stud event, taking home $135,600, and again at the 1997 WSOP Deuce to Seven Draw event, where he made $164,250. He had a very good five years once 2000 came around; winning the 2000 WSOP Pot Limit Omaha event, winning $178,800. His next win didn’t come until the 2002 WSOP No Limit Hold'em Gold Bracelet Match Play, where he won $34,000. He had another two bracelet wins in 2003, playing in the No Limit Hold’em and Pot Limit Omaha events; from those two event he managed to win $382,500. His last WSOP tournament win came in 2005 at the Pot Limit Hold’em event, where he won $303,025. His strong suit has been playing in the WSOP events, however he has also participated in the World Poker Tour; he has yet to reach a final table at these events. He also plays in other prestigious tournaments and cash games. Chan has been dubbed the “Orient(al) Express”, due to his background and the fact that he ploughs through his opponents. With his family heritage of being restaurant owners and managers, he also owns a fast-food franchise located at the Las Vegas Stratosphere Hotel. He aspires to one day to be able to open his own casino. He has also written articles for Card Player magazine, as well as collaborated in writing two books, ‘Play Poker Like Johnny Chan’ and ‘Million Dollar Hold’em: Winning Big in Limit Cash Games’. These books are aimed to helping, new and old, players by giving instructions on different types of poker, especially focusing on limit hold’em in his second book. He has been featured in TV shows, magazines, and even in movies. He has appeared several times in the hit TV show, ‘Poker After Dark’, where he has managed to be the player with most wins on the show. He also made two appearances in the TV show ‘High Stakes Poker’. He made a cameo appearance in the 1998 film, ‘Rounders’, where he played as himself when playing against the main character, Matt Damon. He was also featured in the 2009 film, ‘Poker King,’ where he also played as himself. Chan has had many successes throughout his poker career, and his most notable events have been during the World Series of Poker. He has won a total of ten times, making him one of the few players with ten bracelets. He has also gotten to 17 final tables and had 44 money finishes. With his consecutive wins in 1987 and 1988, he got the highest ITM main event finish for those years. Although he has participated in various events in the World Poker Tour, he has been unable to get to the final table; he has however, had 5 money finishes. In 2010, his total live tournament winnings were over $8,500,000. His success cannot be measured solely as a poker player, since he is also an entrepreneur and a businessman; owning a fast-food chain in Las Vegas. He has been able to adapt and enjoy his time in Las Vegas.